doi:10.4236/jbise.2010.37095 Published Online July 2010 (http://www.SciRP.org/journal/jbise/). Department of Community Medicine, Government Medical College, Chandigarh, India. 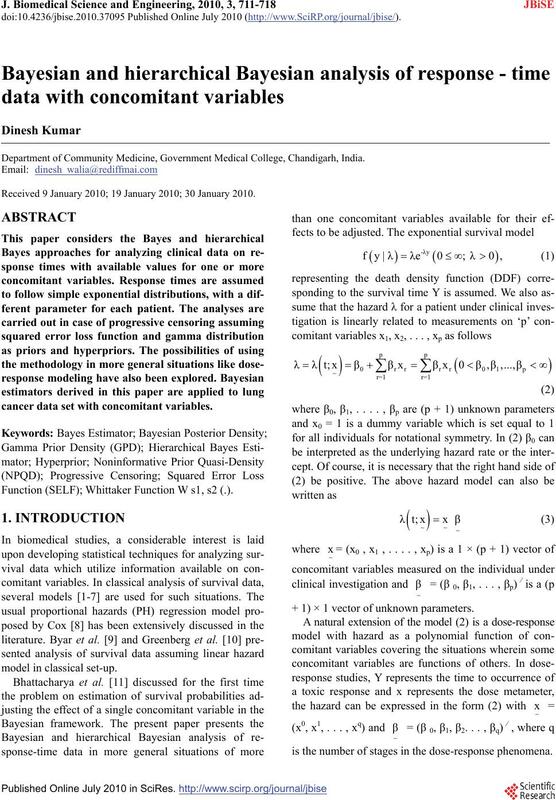 Received 9 January 2010; 19 January 2010; 30 January 2010.
cancer data set with concomitant variables. Function (SELF); Whittaker Function W s1, s2 (.). 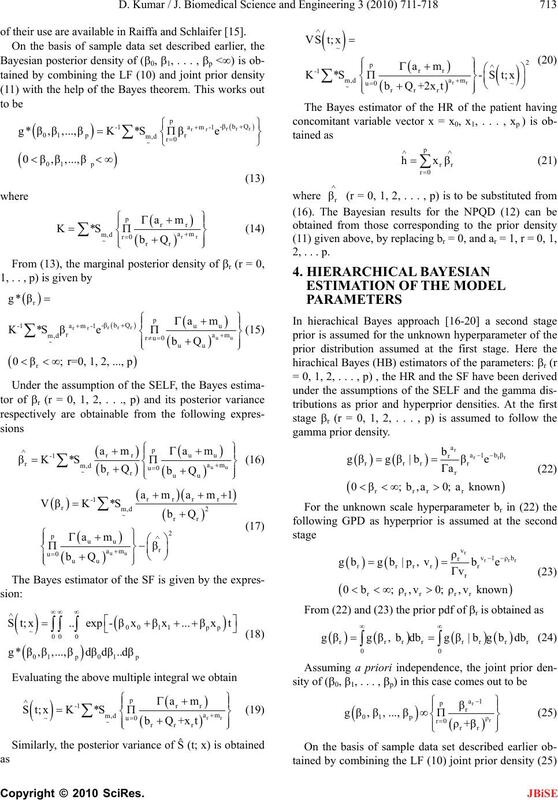 + 1) × 1 vector of unknown parameters. 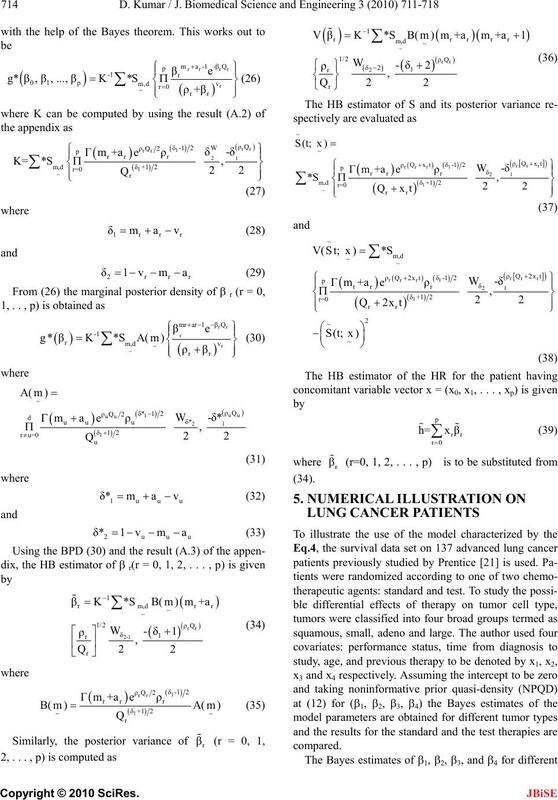 is the number of stages in the dose-response phenomena. Cox model to the analysis of dose-response experiments. able in an expository paper by Kalbfleisch et al. .
data set on advanced lung cancer patients. 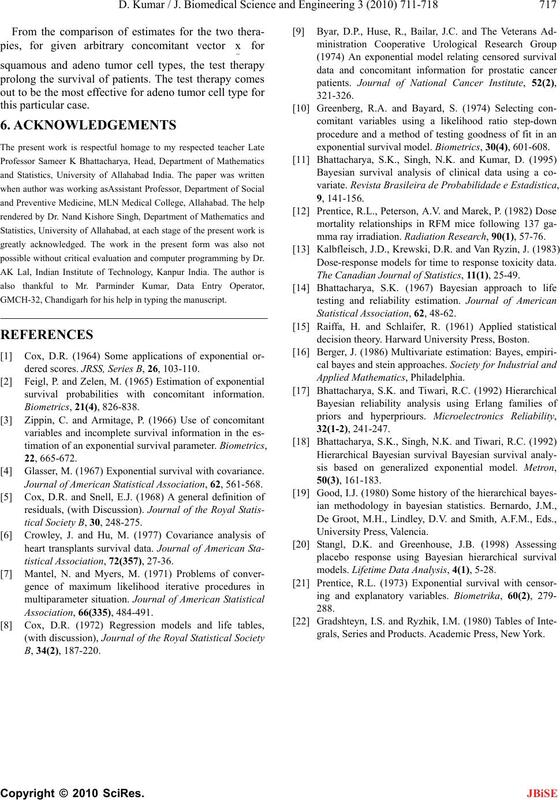 sis is elucidated in a basic paper of Bhattacharya . of their use are available in Raiffa and Schlaifer . 2, . . . p.
Table 1. 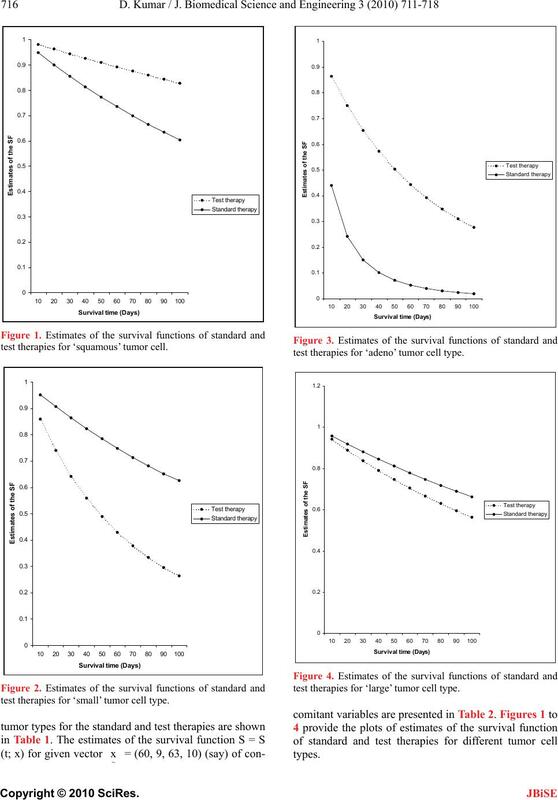 Estimates of model parameters for different tumor types. Table 2. 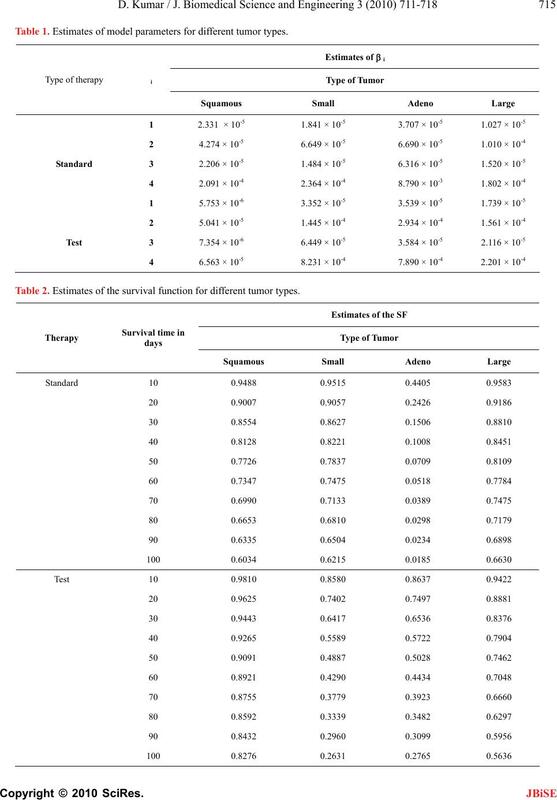 Estimates of the survival function for different tumor types. test therapies for ‘squamous’ tumor cell. test therapies for ‘small’ tumor cell type. test therapies for ‘adeno’ tumor cell type. test therapies for ‘large’ tumor cell type. possible without critical evaluation and computer programming by Dr.
GMCH-32, Chandigarh for his help in typing the manuscript. dered scores. JRSS, Series B, 26, 103-110.
survival probabilities with concomitant information. 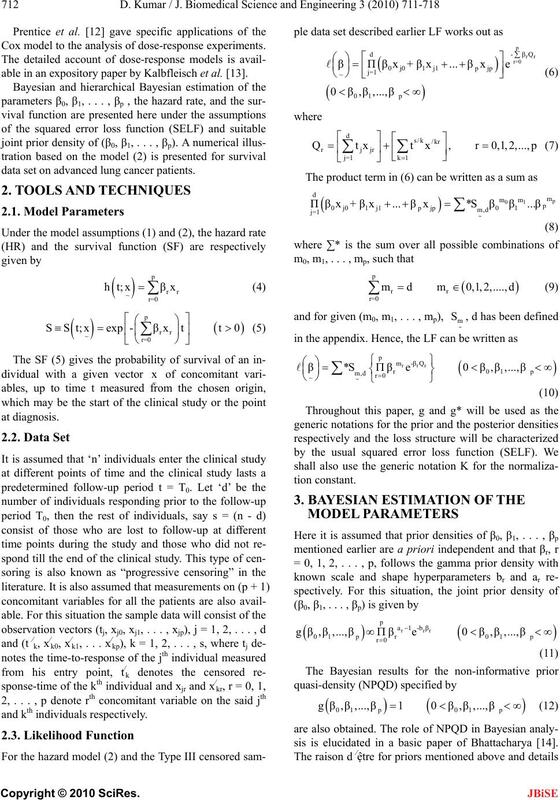 Glasser, M. (1967) Exponential survival with covariance. Journal of American Statistical Association, 62, 561-568.
tical Society B, 30, 248-275.
exponential survival model. Biometrics, 30(4), 601-608.
mma ray irradiation. Radiation Research, 90(1), 57-76. Dose-response models for time to response toxicity data. The Canadian Journal of Statistics, 11(1), 25-49.
decision theory. Harward University Press, Boston. models. 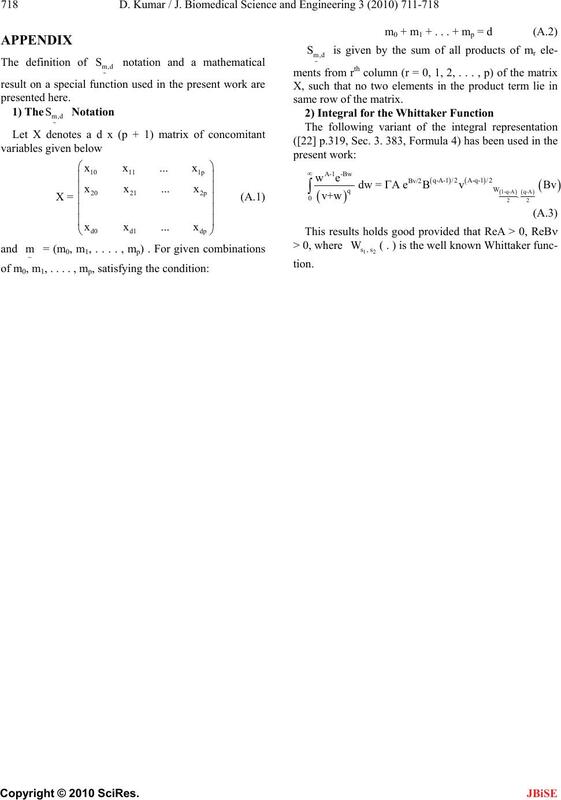 Lifetime Data Analysis, 4(1), 5-28.
grals, Series and Products. Academic Press, New York. same row of the matrix.